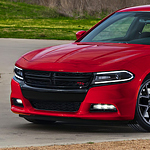 As a mid-size sedan, the Dodge Charger has grown up from its sporty roots. Today's model features a lot of useful technology, including the hands-free, voice-activated controls. Get the navigational info you need, change the media or make or answer a call with this system. It works with all Bluetooth-compatible devices. Are you on a long road trip, or you forgot to charge your phone at home? You need not worry, because the Dodge Charger includes two USB ports and another auxiliary port for charging your iPhone, Android or another type of smartphone. You can also use them to charge your iPad or any other device that you need to use. Do you want to check out this technology in person? Come visit us at Chilson's Corner Motors of Cadott for a test drive of the Dodge Charger today.